Militants martyred more than 230 people at a mosque in North Sinai Friday, detonating a bomb and gunning down worshippers in the deadliest such attack of Egypt’s modern history, state media and witnesses said. No group immediately claimed responsibility, but since 2013 Egyptian security forces have battled a stubborn Wahhabi Daesh [Arabic acronym for “ISIS” / “ISIL”] affiliate in the desert region, and militants have killed hundreds of police and soldiers. 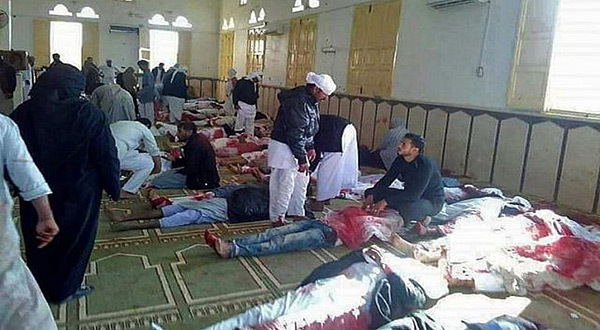 State media showed images of bloodied victims and bodies covered in blankets inside the Al-Rawda mosque in Bir al-Abed, west of Al-Arish, the main city in North Sinai. Worshippers were finishing Friday prayers at the mosque when a bomb exploded, witnesses said. Around 40 gunmen set up positions outside the mosque with jeeps and opened fire from different directions as people tried to escape. “Four groups of armed men attacked the worshippers inside the mosque after Friday noon prayers. Two groups were firing at ambulances to deter them,” said Mohammad, a witness. The public prosecutors’ office said 235 people had been killed and 109 more wounded. Hours after the attack, Egypt’s military launched airstrikes on targets in mountainous areas around Bir al-Abed, security sources and witnesses said. “The armed forces and the police will avenge our martyrs and restore security and stability with the utmost force,” Egypt’s President Abdel-Fattah al-Sisi said in a televised address. Egypt later said it would delay the opening of the Rafah border crossing to Gaza after the attack due to security concerns. The crossing had been due to open for three days beginning Saturday. Striking at a mosque would be a change in tactics for the Sinai militants, who have usually attacked troops, police and Christian churches. The militants have also attacked local tribes and their militias for working with the army and police, branding them traitors. Sisi, a former armed forces commander who presents himself as a bulwark against extremist militancy, convened an emergency meeting with his defense and interior ministers and intelligence chief soon after the attack. Security has long been one of the key sources of public support for the former general, who is expected to run for re-election early next year for another four-year term. Lebanese Prime Minister Saad Hariri contacted Sisi to give his condolences for the attack. “The world cannot tolerate terrorism, we must defeat them militarily and discredit the extremist ideology that forms the basis of their existence,” he added. A White House statement called on the international community to strengthen its efforts to defeat terrorist groups. Russian President Vladimir Putin sent condolences to Sisi, calling the attack “striking for its cruelty and cynicism,” while condemnations poured in from Iran, Saudi Arabia and other countries. French Foreign Minister Jean-Yves Le Drian also condemned the attack and said Paris stood with its ally.